December 25 we celebrate Jesus birthday. No one who meant anything while he lived celebrated that anniversary. They genuinely wished had not been born. For a long time, people with power could ignore him. An itinerant preacher out in the villages might attract a little attention, but leaders in large cities had other things to think about. Like money. Then Jesus comes to Jerusalem, the heart of economic wealth, political power, and religious authority. He walks into the Temple, fashions a whip with cords, and drives people and animals out. Now he had people’s attention. Political cartoon by Art Young, The Masses, 1917. Leaders change, and so do their reputations. You know what we do with troublemakers, don’t you? That’s the standard threat to keep troublemakers in line. 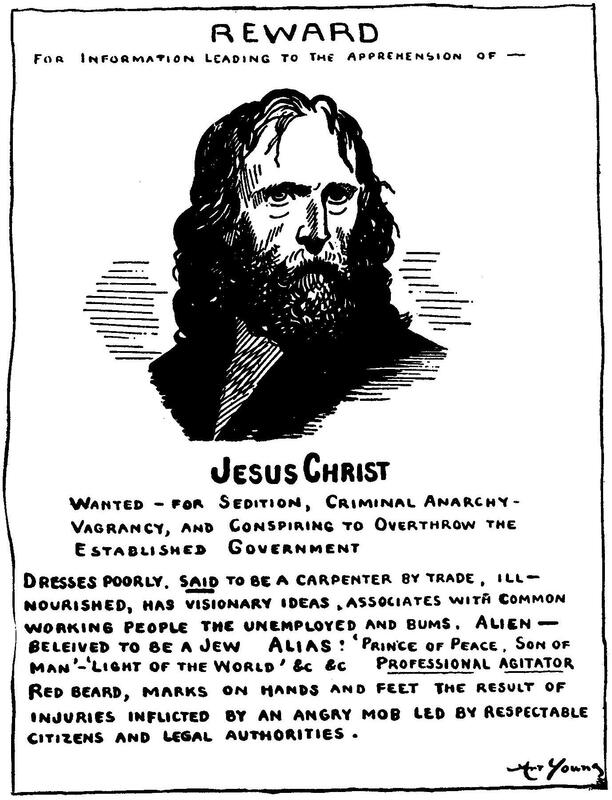 Jesus, as the wanted poster above indicates, was the biggest troublemaker the Sanhedrin had on its hands during Passover of Jesus’ thirty-third year. He comes to town riding on a donkey, and next thing you know, he clears the temple. He had his own motives, the Sanhedrin had theirs. With so many visitors in town, Temple elders turned the holy grounds into a market: a place to conduct commerce. You could take out a loan, pawn possessions, buy local currency, and of course purchase animals for the traditional sacrifice. If you wanted to cheat the country folks, that was okay, because you weren’t going to see them again. You could conduct your business honestly if you wanted, but no one would shut your table down if you didn’t meet certain standards of business ethics. So you can’t prevent religious holidays from being influenced by commerce. What made Passover in Jerusalem different – the buying and selling particularly brazen – was the location. Money changers and livestock vendors set up their tables right in the Temple. Pilgrims to Jerusalem could not come to worship or pray – could not properly observe Passover at all – without passing a lot of people shouting at them to give them money. If you want the priest to perform the ritual, pay up. We have the bird or animal you need right here. Even worse, the Temple itself received a large portion of the pilgrims’ total outlay. If the journey to Jerusalem did not cost enough already, Temple leaders stood by to fleece – I mean take their share – of pilgrims’ cash. Like Christmas in the twenty-first century, many people in Jerusalem during Passover thought about money during one of the holiest times of the year. That was especially true of the business men who waited expectantly for the loaded travelers to arrive. None of these practices sat well at all with Jesus. He cleared the Temple for good reasons: as he said, “You’ve disrespected my dad.” That’s an informal way of saying the whole Temple operation violated the spirit of Moses’ commandment against idolatry. In spirit and motivation, it wasn’t so different from the Church’s sale of indulgences, which provoked the Reformation after so many years of abuse. Jesus act of defiance set the Temple elders to talking: What are we going to do with this man? When you disrupt established practice, you generally threaten the position of privileged people. Those threatened work to bring you down, as quickly as they can. They’ll say whatever it takes to discredit their target. If that means charging an outspoken, truth-telling person with sedition and conspiracy, then that’s what it takes. People have to believe those in authority. Everyone knows that if you don’t, and you say so, you’re the next troublemaker. I wish you and your family a peaceful and happy Christmas. Not because some people think “Happy Holidays” is liberalspeak for sacrilege or treason, but because Christmas is a meaningful holiday for you, and I respect that. Thanks for your comment! And for the link. I like the theme of troublemakers, and how people respond to them. Adrian Kronauer in Good Morning Vietnam is an example from our generation of films. I hope you and your family have enjoyed the holidays, too. Happy New Year coming up!